International Medicine Center (Houston) - Book Appointment Online! 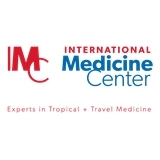 International Medicine Center is the leading provider of travel medicine services and physical exams in Houston, Texas. Since 1990, Dr. Edward R. Rensimer and the IMC staff have been vaccinating, educating, and treating international travelers. Some of Houston's largest global companies use IMC services to safeguard their employees, manage their medical expenses, and to receive expert medical advice on issues such as Malaria prevention. Dr. Rensimer was very friendly and open, while engaging with you to understand your particular situation in as much detail as possible to provide the best direction going forward.